"Every night in my dreams, I see you..." you hear the music slowly fading as you turn off your sound system. You have always listened to that song. And knowing the story associated with it gives the song much more meaning. What you remember the most is the lady and her necklace. As you are thinking about it, you saw an old couple walking on the streets. They stop every once in a while and they look around. You can't help but be curious so you walked towards them. And that's when you learned they are looking for the missing diamonds of a necklace. You find them both so sweet to look for the stones together. So your soft and fluffy heart easily decided to help them find it. However, because of their old age, they find it hard to really see the stone from afar. And it's where your help comes in. Help the old couple complete the necklace just like it would complete their remaining life. You looked at them lovingly and you became determined to finish what they have carefully started. 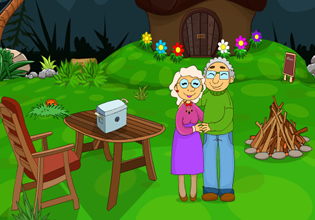 Lost Diamond Necklace room escape game by Mirchigames is a fun and touching game where you will help an old lady find her diamonds.